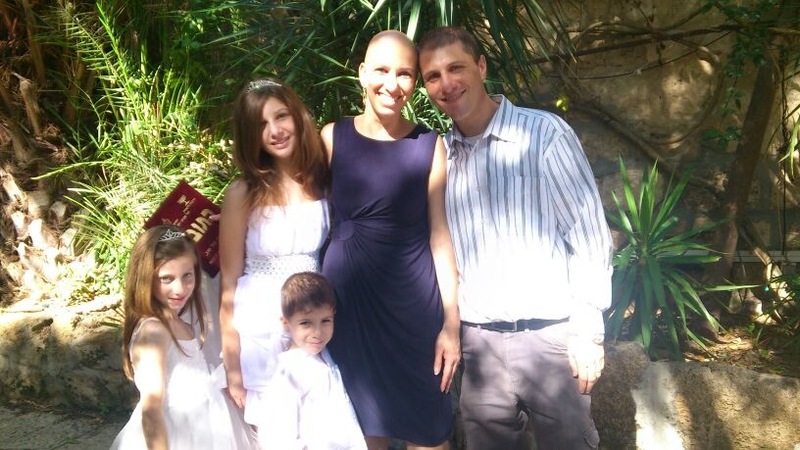 Our global Bald Girls Do Lunch network takes us to Israel this week for Keren Barak's triumphant story which began when the Israeli native developed alopecia areata at fifteen. Self-described as a then very shy girl, Keren later emerged from mandatory Israeli Army service anything but. In the Israeli army and beyond, Keren's choices on the road to becoming the self-confident woman she is today surprised even herself. Translated from Hebrew, Keren's two-part emailed interview with Thea begins this week. Before I was drafted, I was very worried that I would be barred from serving because of the alopecia. At that time, Army law prohibited women from shaving their heads so I decided to hide my disease. I appeared at the medical exam and all subsequent draft appointments wearing a wig. I knew from the very beginning that I wanted to serve in the army. I wanted to serve my country and I wanted to serve as an officer. I began my service in the Intelligence Corp. I served my two mandatory years and then another eighteen months as a non-commissioned officer. I retired as a first lieutenant. When I was drafted, I felt ugly. On the first night of basic training I told the girls in my tent about the alopecia. I asked them to keep it a secret. For some reason, I thought I would be able to get away with it. The very next day at morning parade, the officers in charge made us stand in a line and told us that we were all going to be checked for head lice. I immediately realized THIS WAS IT! – they knew about me and this was their way of “finding me out”. That morning I walked slowly along with the column all the while debating with myself how I should handle coming out. In the end I just left the column, walked up to the squad commander and told her there was no need to undertake a lice check of the entire platoon just for me. She gave me an annoyed look. So, I simply took off my wig! They had no idea how to handle me. They started making phone calls and sent me for medical tests. Finally, everything worked out. I was simply required to wear a wig or a hat at all times. Up until that point I was a mousy girl. That moment – that exposure – on the basic training parade ground changed something in me. It ignited something inside me. It awoke a self-confidence I never knew I had. Throughout basic training people would stare at me. I learned I could provocatively and deliberately take off my hat or wig and enjoy the amazed looks. I discovered I had strengths I had never imagined existed within me. I finished basic training with high honors. What happened? As soon as I understood that other people believed I had something to offer – it made me believe that I have something to contribute, that I have strengths and that I am worth something. After my acceptance into officer school, this feeling only increased. Knowing that I passed myriad exams, that I successfully navigated challenges, and that I came in ahead of hundreds of other girls truly helped my self esteem. Once I started serving in the army, my focus shifted away from the way I looked to my abilities, and that helped me get over my lack of self confidence. During the course of officer school, my hair began to grow spontaneously so I completed officer school with short hair. It grew for about four years and fell out in my second year at university. Keren’s journey from army service to university (she holds a Masters in Mathematics) and into her successful career as a statistician in the credit risk department of a large bank had twists and turns we can all relate to. Next week we continue Keren’s story as she tackles employment interviews, her first job and describes a startling incident that happened very recently because she is a confident woman with alopecia areata. Do you have military experience to share with us? We would love to hear your story!